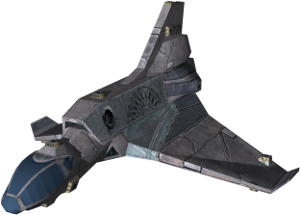 Note: This ship was modified on HHC from the vanilla Freelancer version. Built from the ground up by Orillion's Corps of Engineers, the Anubis is a one-of-a-kind class of ship. It has been completely outfitted for optimal performance in combat, with the best possible balance of power, armor, and weapon extensibility. It is used by The Order to infiltrate, secure, and, if need be, quickly dominate in hostile situations. Though it is not an easy ship to fly, in the hands of a skilled pilot the Anubis is unbeatable.